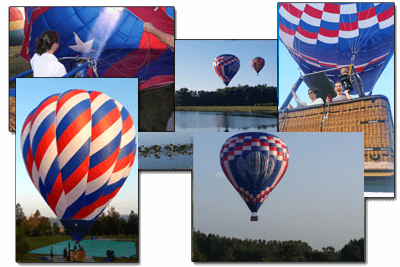 American Balloons specializes in hot air balloon adventures throughout the East Pasco and Northern Hillsborough county areas. American Balloons has been operating in hot air balloon rides since 1998. We offer a whole new way to experience the beautiful world around you. Hot Air Balloon Rides are great for Birthdays, Anniversaries, Engagements, Weddings, and Just Because. American Balloons works hard to provide you with a very personal experience making you want to come back again and again(and bring your friends). Hot air balloons only fly once a day, allowing you to experience the beauty of the Florida sunrise. A hot air balloon ride includes a one hour ride over the beautiful growing terrain of Wesley Chapel, New Tampa, Lutz and Land O Lakes; going wherever the wind may take you. Your hot air balloon ride is followed by a traditional champagne toast and a light brunch at our location. American Balloons is the only hot air balloon ride company in Pasco County and works closely with the Hampton Inn and Suites to provide you the amenities of an overnight stay at a beautiful 5 star hotel, and a delicious breakfast when we return from our morning adventure. For special rates at the hotel please contact them at 813-973-2288 and let them know you will be embarking on an amazing balloon ride with American Balloons. We are proud to provide our guests with great pilots and excellent crew and we look forward to hearing from you to book your next adventure. Thank you for visiting.